It seems like everywhere you look businesses are hiring. About 70% of U.S. industries added jobs in November. That explains how the U.S. economy added 321,000 jobs in November, blowing past even the most optimistic expectations. The government's monthly jobs report released Friday showcased that 2014 is heading to become the best year for job growth this century. HIring was more widespread in November than any time since early 1998. By comparison: this time five years ago, 86% of U.S. companies were cutting jobs. "It's about time," said Dan North, chief economist with credit insurance firm Euler Hermes. "This is what we've been missing." Consumers are spending again in a year of strong economic growth, driven by low energy prices and pent-up demand for cars and homes. Job openings are almost at a 13-year high as companies try to meet the latest wave of demand. Businesses are asking their employees to work longer hours and moving some part-time workers to full-time status. 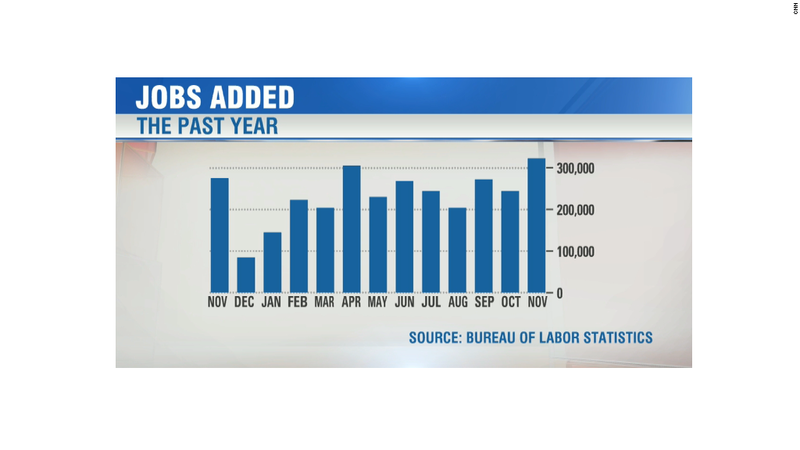 Employers say they expect to be adding jobs in 2015 as well. Very few are cutting staff. Those include department stores and electronics chains that are losing ground to online shopping or other competitors. Also trimming jobs are textile and clothing manufacturers and coal mining companies. Some government employers, including local schools and state governments, are also cutting jobs.